Here's the opinion of the Connecticut Supreme Court in a case we've been following, Barton v. City of Norwalk, No. SC 19671 (July 4, 2017). As we noted in our earlier post where we detailed the facts, the case involved two non-contiguous parcels, one of which was used for a parking lot which the City later condemned to build a police station. The parking lot had provided parking for the commercial building on the other parcel (the City had required the owner to build the lot, after the City curtailed street parking). In the eminent domain case taking the parking lot, the owner claimed damage to the commercial operation and lot, but the court prohibited evidence of that damage. So the owner instituted a separate inverse condemnation claim, seeking recovery for damage to the commercial operation and lot caused by the loss of parking across the street. The court of appeals held that the evidence showed a near total (81%, so not a complete) economic wipeout, and that even though there was some value left in the commercial lot, it was a compensable taking. [W]e conclude that the trial court properly found that the defendant inversely condemned 70 South Main in the present case. After the defendant took the parking lot at 65 South Main, the use of 70 South Main was substantially destroyed. 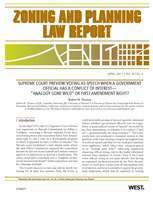 This conclusion is amply supported by the trial court’s findings of fact that the plaintiff faced extreme difficulty renting space at 70 South Main, which, in turn, resulted in a more than 80 percent diminution of its value. As we noted in another recent post, a nearby parcel being used as a parking lot for a separate lot) is one of the classic examples of larger parcel analysis. Why the court in the earlier eminent domain trial didn't include damage to the commercial lot as severance damages for the taking of the parking lot, we can't say. But it worked out in the end. One final note, as we've been harping on lately, we think the U.S. Supreme Court really hosed up larger parcel analysis recently, in Murr v. Wisconsin. Instead of Justice Kennedy's factors, the analysis should have focused on whether the Murrs used their two parcels as one, and instead of establishing a bar no one can understand, much less meet, the Court should have remanded the case for the jury to sort out how the Murrs actually used their land. 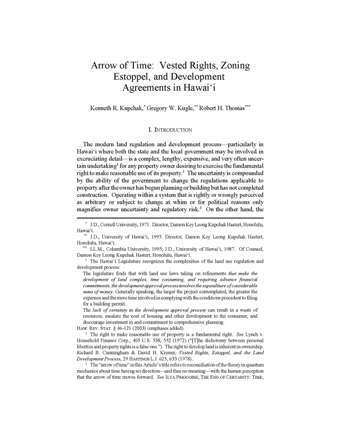 But wait, you say, that's a regulatory takings case involving the situation where a single owner owns two adjoining lots, while in Barton, by the time the inverse case was filed, the owner didn't actually own more than the commercial lot because it had been taken in the eminent domain action. In our view, that's not a critical difference (since the court should have considered the larger parcel issue during the eminent domain case, when the owner still owned both lots). We think that claims of larger parcel -- whether it is the owner seeking to widen the scope of the severance damages in an eminent domain case, or the government trying to diffuse the impact of the regulation across more than a single parcel -- should be the same in both straight and inverse takings cases. More to come on this latter thought.